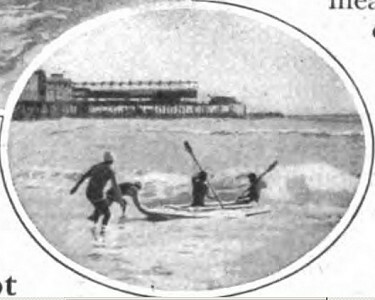 A. M. Nelsen : Surf Kayak, 1917. 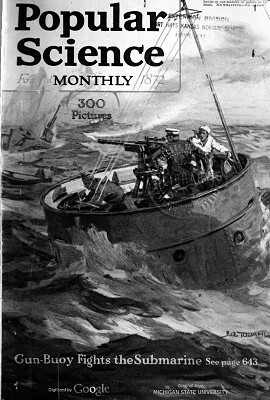 Volume 91 Number 1, July 1917. A NEW life-boat built along the lines of a big surf board, has proved so satisfactory that it has been officially adopted by the city of Long Beach, California. The boat, sixteen feet long, forty inches wide and fourteen inches deep, is non-capsizable and self-draining, and is the invention of A. M. Nelsen of Long Beach. It has many advantages over the skiffs now used by the municipal life-guard squad of that city. It can be put out through the heaviest surf without waiting for a calm. 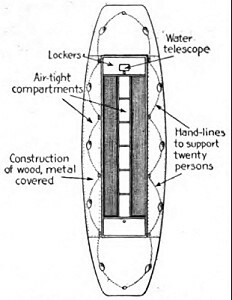 It has air tanks on both sides, at the ends, and down the middle, and has a glass bottom through which bodies that may have sunk may be located. With one man paddling, and the other stretched at full length peering through the glass bottom, a body can be located in twenty feet of water and brought to the surface by means of grappling hooks or by diving after it. 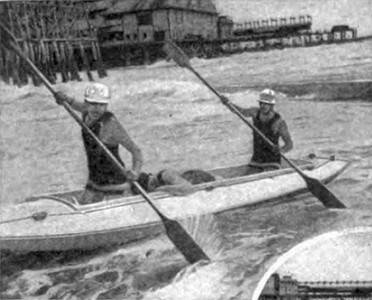 The boat is propelled with double-bladed paddles by two guards. It can make a speed of six miles an hour and will support twenty people. The new life-guard boat which can not capsize. The man lying down is looking through the glass. Launching the boat in heavy surf. Geoff Cater (2017) : A. M. Nelsen : Surf Kayak, 1917.